"Good morning. Please send housekeeping and room service." This was the scene from her medical bed this morning - one very relaxed bunny! Hope is much happier now that she has pain meds. Overnight her GI tract started working again and she ate all of her pellets. That is remarkable. Thank you to everyone, especially Dr. Raj Singh and the staff at Sunnyvale Veterinary Clinic for stabilizing her in a crisis situation last evening. Thank you to Sarah for emergency housing. Hope is doing everything she can to stay strong for her visit this morning with Dr. Carolynn Harvey at Chabot Veterinary Clinic. We will know more this evening. Your support is much appreciated. If you would like to donate toward's Hope's ongoing care you can use The Haven's PayPal account online or donate by check. We will keep you posted on her progress. 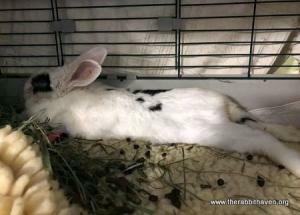 Today our shelter rabbit advocate went into the shelter to check on a special needs rabbit. What she found was a sweet yet terribly injured girl in distress. She apparently suffered extreme facial and tooth injuries as well as an eye injury. She was cold and was clearly suffering and miserable. She was having difficulty swallowing and her tongue was catching on her teeth causing even more pain. The advocate sent us a video of the rabbit and it was so telling and heartbreaking, we rescued her instantly. She clearly needed veterinary care immediately. It was after four PM and most Vet hospitals were closed or would be closed by the time we could get there. Then Dr. Raj Singh, DVM of the Sunnyvale Veterinary Clinic answered our prayers and agreed to stay and wait for her and provide emergency care. Our shelter advocate Sarah took her immediately to Dr. Singh at Sunnyvale Veterinary Clinic. Dr. Singh needed to stabilize her on arrival as her temperture was subnormal and she was in great pain. He gave her pain meds then proceeded to warm her, evaluate her, and decide what he could do to help her. It turned out that both top and bottom teeth were pushed out of place so that her tongue was getting stuck on the teeth. She was unable to open or fully close her mouth. Both her mouth and jaw were pushed in on one side. This injury is complex involving teeth, mouth, jaw, eye and cheek. She was also critically underweight at 3.2 pounds. 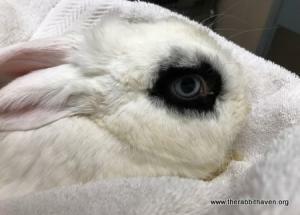 On top of all the obvious injury the rabbit was also in GI Stasis. After her temperature was brought up to a relatively normal level, Dr. Singh trimmed the top and bottom teeth to help her eat more easily. He noted that the inside of her mouth was badly infected and added in a strong antibiotic to her fluids. After a few hours of hospital care she was stable enough to go home with wonderful Sarah who will keep her overnight. Sarah will provide critical care feeding, more fluids and antibiotics tomorrow and pain medications to manage her pain. Since she was in the Haven she had to have a name, so we named her Hope. At last check-in tonight Hope was snuggled in happily resting on her heated bed, fresh water and good food nearby. Critical care and pumpkin were on the menu and Hope had managed to try to pull in hay to eat. She is a dear rabbit and she is trying so hard to survive. She just needs help. Tonight the pain meds are helping her to relax and the fluids have helped her remain hydrated. Her mouth is functioning better and her tongue is no longer stuck on her teeth. The tongue is injured but it will heal. She is still struggling somewhat to eat. She is able to drink water. She is stable for tonight, yet she has such a long road ahead of her before she is healed. Tomorrow if all goes as planned, Hope will be transported by awesome James Wilson to see Dr. Carolynn Harvey, DVM at Chabot Veterinary Clinic in Hayward. Dr. Harvey plans to examine Hope, take x-rays and may possibly try to repair her jaw and injured side teeth. It is possible that there is an abscess inside the mouth as well so that also needs to be addressed. Hope's medical plan will be continued tomorrow. After Dr. Harvey sees her we will have much more information on all of her surgical and medical needs. She is badly injured. We do not know how long she has endured this injury but she is letting all of us know she has a strong will to live. We are just as determined to help her have her health back and more. I know that somewhere out there, there is a special family just for Hope. Cost of her care will be extensive even with sizable discounts these fine doctors offer to the Rabbit Haven. To help Hope get well, please send your get well wishes and lend your support to help us pay for all the medical care she will need. We are determined to help her to the best of our ability. We love her already. She is a special little girl. We will keep you posted on her well being. Watch this page for updates as well as our Facebook page. To donate to loving Hope you can use The Haven's PayPal account online or donate by check. She sends her love and thanks!